The well-recognized “chasing arrows” symbol we see on plastic containers and products does not mean the product is recyclable. The little number inside the triangle tells the real story. PET is one of the most commonly used plastics in consumer products, and is found in most water and pop bottles, and some packaging. It is intended for single use applications; repeated use increases the risk of leaching and bacterial growth. PET plastic is recyclable and about 25% of PET bottles in the US today are recycled. PVC is a soft, flexible plastic used to make clear plastic food wrapping, cooking oil bottles, teething rings, children’s and pets’ toys, and blister packaging for myriad consumer products. LDPE is often found in shrink wraps, dry cleaner garment bags, squeezable bottles, and the type of plastic bags used to package bread. Some clothing and furniture also uses this type of plastic. Polypropylene plastic is tough and lightweight, and has excellent heat-resistance qualities. Polypropylene is recyclable through some curbside recycling programs, but only about 3% of PP products are currently being recycled in the US. Polystyrene is an inexpensive, lightweight and easily-formed plastic with a wide variety of uses. Recycling is not widely available for polystyrene products. While the technology for recycling polystyrene is available, the market for recycling is small. Polystyrene should be avoided where possible. 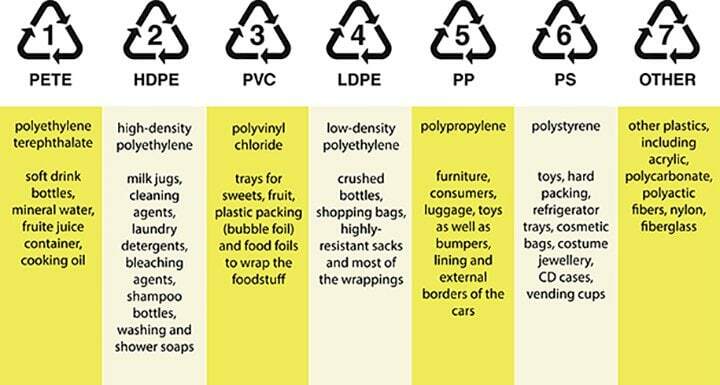 The #7 category was designed as a catch-all for polycarbonate (PC) and “other” plastics, so reuse and recycling protocols are not standardized within this category. Number 7 plastics are used to make baby bottles, sippy cups, water cooler bottles and car parts. #7 plastics are not for reuse, unless they have the PLA compostable coding. When possible it is best to avoid #7 plastics, especially for children’s food. Plastics with the recycling labels #1, #2 and #4 on the bottom are safer choices and do not contain BPA. PLA coded plastics should be thrown in the compost and not the recycle bin since PLA compostable plastics are not recyclable.